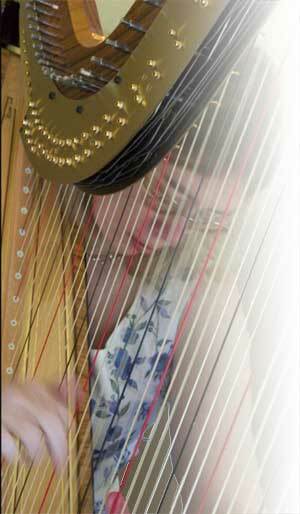 Jenny Broome is a professional harpist with more than ten years experience in many different types of music. She studied the harp with Daphne Boden at the Junior Department of the Royal College of Music. While reading Architecture at Cambridge University she continued her harp studies with Renata Scheffel-Stein. As a student Jenny was an active musician, playing principal harp with CUMS and many other orchestras in Cambridge. Nevertheless she qualified as an architect and practised for a while. Since 1993, Jenny has turned to the harp full-time and has a busy freelance career, playing all sorts of music both for weddings, dinners and business functions and for the full range of classical concerts. Jenny plays a beautifully inlaid Salvi Arianna harp. She also has a Dodd harp of 1840 and has given programmes of 18th  19th century music where appropriate. As a freelance player, Jenny plays for many orchestras in the south of England. She is the regular harpist for Stowe Opera where she played the important harp solo in Lucia di Lammermoor. She has made recordings of music by Paul Carr for Claudio Records and of Francis Grier’s new oratorio ‘Around The Curve of the World’ for Somm and of Britten’s Ceremony of Carols. She has broadcast for Radio 4 and played for the Royal Shakespeare Company in A Midsummer Night’s Dream and The Tempest. Jenny plays solo, in concertos and a wide variety of chamber music. Jenny is a busy and successful teacher, both privately and in schools.